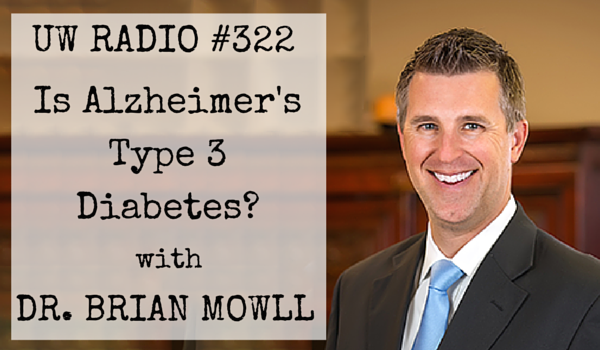 #322 – Is Alzheimer’s Type 3 Diabetes? Dr. Brian Mowll, host of the upcoming Diabetes Summit, discusses how insulin resistance in the brain may be at the root of Alzheimer’s and dementia. And what you can do about it! 2:10 – How The Diabetes Coach came to be and found his passion for helping people lost in the medical system with whole body diabetes care. 12:30 – Brain food: the biggest feeder on sugar in your body and what it means for insulin. 16:13 – This is your brain on fire – the vicious cycle of plaque, tangles and inflammation that is preventing your brain from working right. 25:25 – Is insulin resistance affecting your mood or is your mood affecting your insulin levels? Here’s why it might not even matter. 26:42 – The ADA’s “appetite for profit” and how money is influencing the standard of care for diabetics. 30:27 – “There’s no evidence that sugar has anything to do with diabetes.” Is sugar really to blame or should we give it a break? 33:48 – Dr. Mowll recommendations (with some surprises) for preventing and maybe even reversing Type 3 Diabetes and Alzheimer’s. 40:10 – Is your fat protecting you? How cutting too many carbs can cause a problem and why a little extra weight might not always be a bad thing. 46:19 – Supplements and nutrients vital to blood sugar regulation plus some medications you might want to avoid! This entry was posted on Wednesday, March 25th, 2015 at 11:48 am and is filed under Uncategorized. You can follow any responses to this entry through the RSS 2.0 feed.